Are Singaporeans Prejudiced Against Foreign Talents? 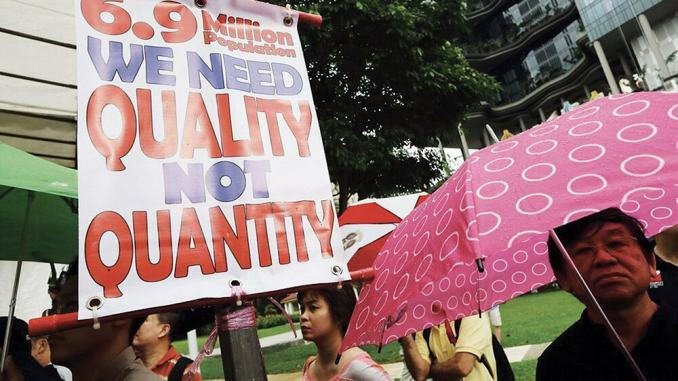 Posters at the May Day rally in 2014 to protest against having 6.9 million people in Singapore by 2030. SINGAPORE – In recent years, the use of the phrase “foreign talents” as an umbrella term for foreign nationals who are working in Singapore, some of whom may even be naturalised citizens, is a sign of the emergence of xenophobia in Singapore society. It is timely that Singaporeans understand from the scientific perspective xenophobia and its social implications, lest such acts are committed unwittingly. Studies and surveys have been conducted on Singaporeans to understand the intense discussions on why locals are turning xenophobic. Let us explore the much talked about word in town. What exactly is xenophobia? The word itself comes from two Greek words ‘xenos’ meaning stranger and ‘phobos’ meaning fear. Xenophobia denotes a hostility toward a stranger perceived as a threat. Education scientist Margarita Sanchez-Mazas from the University of Geneva and social psychologist Laurent Licata from the Free University of Brussels studied the social, psychological and cultural aspects of xenophobia. They summed it up as a fear of unfamiliar people, such as immigrants or descendents of immigrants who are perceived to pose as a threat to the local people. In other words, foreigners who are staying or working in a host country are very often the target of xenophobia amongst the local people. Why is there a fear of an unfamiliar person? This can be traced back to history where outsiders are generally linked to risks, strange customs, contamination or even unhygienic habits. In the Middle Ages in Europe, Jewish people received enmity as they are alleged to be carriers of germs and infections. Studies have shown that xenophobia arises in locals feeling threatened by the arrival of migrants. They develop prejudice against the immigrants as they think the overcrowding of foreigners cause the lack of jobs in the country. In addition, the latter may be more willing to go for low paying jobs, which locals see as taking jobs away from them. Locals may also view the descendents of migrants as foreigners even if they have attained the host country’s citizenship. Sanchez-Mazas and Licata reported on a study in Switzerland where locals felt that their identity is threatened, such as their social practices, values, and culture. This is especially evident when the values of the foreigners do not fit in. A case in point is Filipino Ello Ed Mundsel Bello, a former nurse here who was jailed for four months for insulting Singaporeans and also lying to the police during investigation. When Singaporeans first found out about his posts on Facebook, they were concerned by his inflammatory remarks and alerted his employer to make an investigation. Upon learning that he was dismissed, many left comments on the Tan Tock Seng Hospital Facebook post, saying that they were glad to hear of the decision. They made it clear that such a person is not welcome in the country. The result of an online poll by Yahoo! News in 2012 showed that 80% agreed that “Singaporeans are turning xenophobic”. However, it does not mean that Singaporeans are against foreigners, as noted by Yahoo! readers. Two years later, a research compilation published in 2014 by the National Youth Council concurred that youths in Singapore are generally at ease with having a neighbour from a different nationality, but the figures have dropped to some extent, due to the influx of immigrants. With the continuing inflow of immigrants to Singapore, cultural and value differences between the immigrants and those on home ground will surface and amplify. Take for example recent Chinese immigrants from China. They are stereotyped to have ‘uncivilised’ behaviour such as not queueing up and talking loudly in public, which have reportedly raised complaints from locals. Singaporeans of Chinese descent have their forefathers coming from China as well. Why do current ethnic Chinese Singapoeans perceive themselves differently from the new immigrants from China? It is timely to take a closer look. Over the last few decades, China has taken a different route from comparable countries. While ethnic Chinese people in Southeast Asia, Taiwan, Hong Kong and other parts of the world have enjoyed unhampered growth both economically and culturally, largely rooted in traditional Chinese values, people in China have taken an unusual path. The people of China have been shrouded in a foreign doctrine that injected cancerous elements into the fabric of the society. Since 1949 under the communist rule, the moral fabric of China has been compromised. Chinese socialism and its parent ideology communism are indoctrinated in violent revolution in which the strong overthrow the weak, much as how predators and prey interact in the animal kingdom. Everything else becomes irrelevant. This was manifested brutally during China’s Great Proletarian Cultural Revolution (1966 – 1976), where even kinship was reduced to fear and antagonism, and faith and beliefs outcast as superstitions. Such social doctrines are orthogonal to traditional Chinese values and virtues that upheld Chinese society for the past thousands of years. Traditional Confucian philosophy advocated concepts like 仁 (humanity or humaneness), 義 (righteousness), 忠 (loyalty), 孝 (filial piety), and 禮 (ritual). Many of these concepts were either labelled as revolutionary or anti-revolutionary by the Chinese communist regime or banished during political movements that have been plaguing China since 1949. The groundbreaking book ‘Nine Commentaries on the Chinese Communist Party’ details how communism destroyed traditional Chinese culture. Nursed on communist doctrines devoid of many traditional values and virtues, cheating and fraud are China’s favoured approaches. From cheating in exams to poisoning milk powder and other foods, to even obfuscating economic growth figures, global news outlets have reported on these endemic problems in the PRC – which are so commonplace that they are now part of Chinese culture. Understanding the socio-political history of new immigrants, Chinese or otherwise, can help bridge the empathy gap between locals and foreigners. By doing so, locals will start realising how immigrants themselves might also be victims of their home country’s politics. This will spark conversations and encourage further reading up to understand one another – and perhaps even solve problems – better. Xenophobia is a form of prejudice between groups of people with psychological roots. The Realistic Conflict Theory by Sherif framed xenophobia as intergroup conflicts – home group versus foreign group – in terms of competition for scare resources – jobs, housing, welfare opportunities, and so on. This is commonly echoed in Singapore where foreigners have been accused of taking away jobs from Singaporeans. The intergroup relationship becomes a competition in a zero-sum game – what one group gains is the other group’s losses. This often generates resentment in the host community. Where both groups are similar, such as sharing the same ancestry, the home group tries to distinguish itself from the foreign group in an effort to derive a clear and positive image of its own social identity. This is the basis of the Social Identify Theory by Tajfel and Turner. For instance, born and bred Singaporeans of Chinese descent find it difficult to accept fresh Chinese immigrants calling themselves Singaporeans, especially while retaining their native accent. This is a form of symbolic threat where the Singaporean identity has been adulterated, so to speak. What can the host country do to ease xenophobic tension between locals and immigrants? Studies by Allport hypothesised that establishing contact between home and foreign groups reduces prejudice. In Singapore, the National Integration Council (NIC) was established in 2009 to promote and foster social integration among Singaporeans, new immigrants and foreigners. A Community Integration Fund (CIF) was launched to support organisations in implementing integration initiatives. It is worth noting that Singapore’s integration approach does not require new immigrants to abandon their own beliefs and culture. Rather, a common ground is sought where commonalities, values and experiences can be shared with Singapore’s home community so that all parties can work together towards a common aspiration. Also, there is a special United Nations (UN)-proclaimed day for migrants – International Migrants Day. 15 years ago, the UN declared December 18 International Migrants Day, after considering the huge number of immigrants around the world. The Migrant Workers’ Centre in Singapore has been organising the celebration of International Migrants Day since 2009, with last year’s event entering the Singapore Book of Records – the Largest Heart Formation made up of more than 3,000 cards carrying words of appreciation for foreign workers in Singapore. With more than 3,000 cards containing messages thanking the efforts of foreign workers who are building a better Singapore, are Singaporeans really xenophobic? Or is the minority venting their frustration on the Internet not really against foreigners, but locals who merely want to be heard by their government? Initially, xenophobia emerges as a form of intergroup prejudice, which if left unchecked may blossom into outright discrimination. In places like Africa, xenophobia has turned into displays and celebrations of criminality. South Africa has laws stating that where xenophobic sentiments are made public, it amounts to hate speech and cannot be protected by the right to freedom of expression. What has happened in South Africa is a good example of how xenophobia backfires. In April last year, xenophobic attacks in South Africa resulted in people killed, with many injured and thousands displaced. Even though these attacks happened within South Africa, South Africans who are working in other African countries became threatened as a backlash to the xenophobic attacks. When Singaporeans express their prejudice against foreign workers, many forget that their fellow Singaporeans are also foreigners working in the home countries of these workers. Xenophobia is a way in which discrimination and sometimes violence is condoned and even celebrated, and we are all potentially the victims of such violence. In a globalised society such as Singapore where foreigners work and live together with the home community, we should make an effort to understand the social issues of xenophobia and its implications – because naiveté leads to idealism, and idealism leads to problems.